An RV is a big investment, and for many people, it’s a home away from home. They are meant to give their owners pleasurable and stress-free adventures, but the outdoor fun has all too often been interrupted by unfortunate circumstances involving battery theft. RV batteries are obviously a necessary component if you want to be able to operate your vehicle, and if not properly protected by an RV battery lock from Battery Shackle, you could easily find yourself without one due to it being stolen. Whether you have your RV stored on your property or you’re in the middle of a road trip, being forced to deal with this kind of situation will put a real damper on your recreational enjoyment, especially considering how much of a dent a new battery can put into your wallet. Our RV battery guards are designed to provide maximum security for our customer’s batteries and keep them from getting swiped by a criminal. 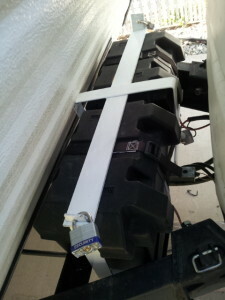 We offer easily installable RV dual battery locks to cover both batteries in varying sizes and colors. Made from quality steel material, our devices are firmly and conveniently fixed in place with padlocks that cannot be removed without an effort that includes bolt cutters, a cutting torch, etc. We manufacture durable RV battery guards that are the perfect answer to any concerns you may have about the potential for thievery. Contact Battery Shackle today for more information on our cost-effective and innovative solution to preserving your RV battery for years to come. We’ll get you set up with the RV battery lock that will best keep your prized possession running without interference from thieves.